If you think cholesterol-lowering statin drugs are an affront to your intelligence because they were approved on the false promise they save lives yet have only been proven to spare one non-mortal heart attack among 70 high-risk or one in 200 healthy adults over a 5-year period, then you will be just as outraged at the latest blockbuster drug Big Pharma just pulled out of its bags of tricks. And why? Because it has just now been shown to ever so slightly reduce the risk for non-mortal heart attacks over an average of 3.7 years from 4.50 events to 3.86 events per 100-person years compared to an inactive placebo pill. In hard numbers that is only a 0.68% difference but in relative numbers that is a 15% difference. Canakinumab is injected once every three months and aims at an inflammatory target called interleukin-1B (IL-1B) that has application in a widespread number of human diseases because inflammation is essentially part of every malady that affects mankind. Canakinumab was first approved by the FDA in 2009 for a couple of obscure diseases. Most sales of canakinumab are for off-label uses. Up till now canakinumab has been used to treat gout, arthritis, Mediterranean fever and a host of other inflammatory-related disorders. In this groundbreaking study it was used among patients whose C-reactive protein (CRP) levels could not be normalized by other means. CRP is a marker of inflammation. Canakinumab is not without side effect. Since controlled inflammation is a part of the human immune response, when it over-inhibits inflammation it can be a killer. Another example of this is the injectable anti-inflammatory drug Enbrel (etanercept) that increases the risk for serious infections when it works too well. Significantly more deaths were attributed to infection or sepsis in the pooled canakinumab groups than in the placebo group. It was not tested among subjects who had a known history or active case of tuberculosis. Nonetheless, six confirmed cases of tuberculosis occurred during the trial. In addition to immune related problems, migraines and vertigo have been reported with the use of canakinumab. Of considerable interest is that in the text of news reports Big Pharma concedes half of the people who have heart attacks don’t have elevated circulating cholesterol numbers. All of the 10,000+ patients in the trial were taking statin drugs. So the effect was over and above that of statins alone. In other words, over and above a non-meaningful 3% decline in risk for a non-mortal heart attack achieved with statins over 5 years. Canakinumab is currently very high priced — $12,800 per injection, but is expected to be more affordable as volume use is achieved. It will still add a billion dollars to health care costs. The idea of a twelve-thousand-dollar injectable drug is outrageous. An idea that may seem impractical is to return the cost of medications back to patients, at least in part, in order to force drug companies to develop drugs that are affordable. With insurance plans or government paying, all that happens is insurance rates rise and nobody gives a damn about whether a new drug is beyond affordability. If the public wants unbridled health care costs and continued lies from the government over inflation, then let government continue to pay our medicine bills. Who cares, the government can print all the money it wants, right? Look what happened when government offered guaranteed school loans. Over 4.2 million students defaulted on their school loans in 2016. Up to $200 billion of these school loans may never be collected. If government is going to guarantee loans, let’s just raise the prices. The government is on the hook to pay off these loan defaults now. Another game that needs to be stopped is the gouging of Medicare. In one instance two equally effective drugs made by the same drug company came into use. Avastin was approved for use as an intravenous anti-cancer drug that starved lung tumor of blood supply by inducing abnormal blood vessels to recede. 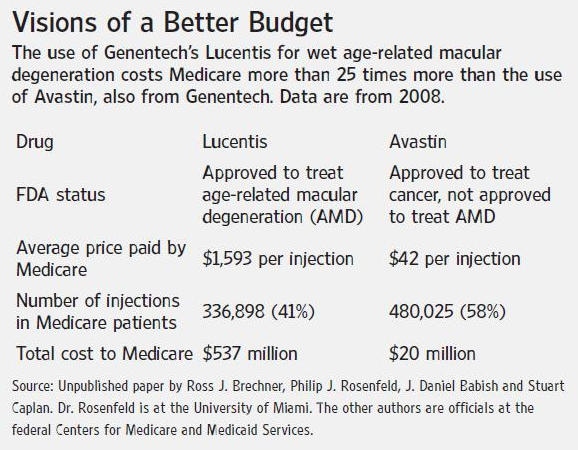 Then Avastin, a $50 a 3-milligram dose monoclonal antibody, came into common off-label use as an injectable drug to treat an eye disorder called wet macular degeneration by regression of abnormal blood vessels that invade the visual center (macula) of the eyes. But the drug company chose to introduce a more expensive drug, Lucentis, at $1000 per dose and conducted human trials only on the more expensive Lucentis to gain FDA approval. The drugs were equally effective. There is no regulation that compels drug companies to offer more economical products or for eye doctors to use the most affordable drug first. What has resulted is that Lucentis has become the most expensive substance sold by weight in world. Meanwhile a natural remedy, the red wine molecule resveratrol consumed as a dietary supplement has been demonstrated to exhibit similar biological action in the eyes to these expensive injected drugs. Moreover, Avastin and Lucentis and a more recently approved third drug Eyelea are not effective in ~15% of the patients, leaving them to hopelessly face permanent legal blindness. When a Nevada-based dietary supplement company petitioned the FDA to conduct a human trial using its resveratrol-based product that was shown to rescue patients who didn’t respond to injectable drugs, the FDA rejected the petition, dooming thousands of patients every year to inevitable legal blindness. To get back to the original report about IL-1 inhibitors for heart disease, wouldn’t you know it, that resveratrol is reported to demonstrably reduce interleukin-1 levels with little or no side effects. Resveratrol is posed as a remedy for arthritis because of its IL-1 inhibiting properties. It has been tested as an anti-leukemic agent by virtue of its ability to inhibit IL-1. Resveratrol is sold as a dietary supplement cannot make any claim it offers prevents, treats or cures any disease but has similar biological action to a $12,000/every 3-month dose of canakinumab. What a perverse world we live in.